Another month has past so we got another food box delivery to our house! 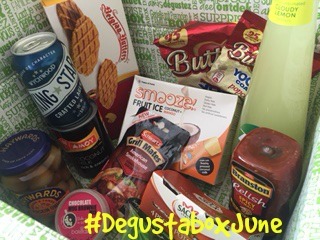 I am always very exited to see what will be in the box and this month even the courier guy was intrigued so i told him a little bit about Degustabox and what to expect and he said that sounds like a fantastic surprise box and i totally agree with him on that! 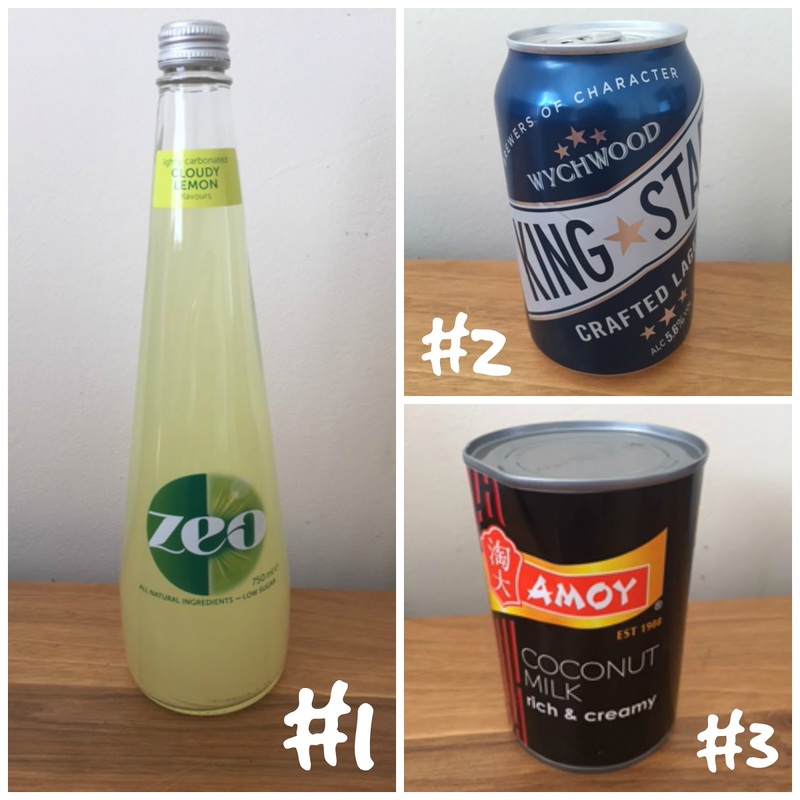 #1 Cloudy Lemonade from Zeo is made with 98% spring water, blended with naturally extracted flesh of succulent lemons with the essential oils from the skin. For sweetness we have added a touch of Stevia and beet and cane sugar, which means each 250ml serving has only 28 calories and 1.5 teaspoons of sugar. I am personally not a huge fan of Lemonade and i didn’t enjoy the taste of it i felt it was very sweet and too tangy for me. #2 A King Star shines brightly on the Wych Wood drawing on the expertise and knowledge of our master brewers to hand craft a big and bold lager which is laced with flavour. This crafted Lager is just the right refreshment for Mr. C. after a hard days work! #3 Amoy Coconut Milk is made from ripe, fresh coconuts. It adds a delicious flavour and richness to traditional Asian dishes such as Thai curries and desserts. I never knew its made by HEINZ which is a family favourite brand for us anyway! I cant wait to make something yummy with this! 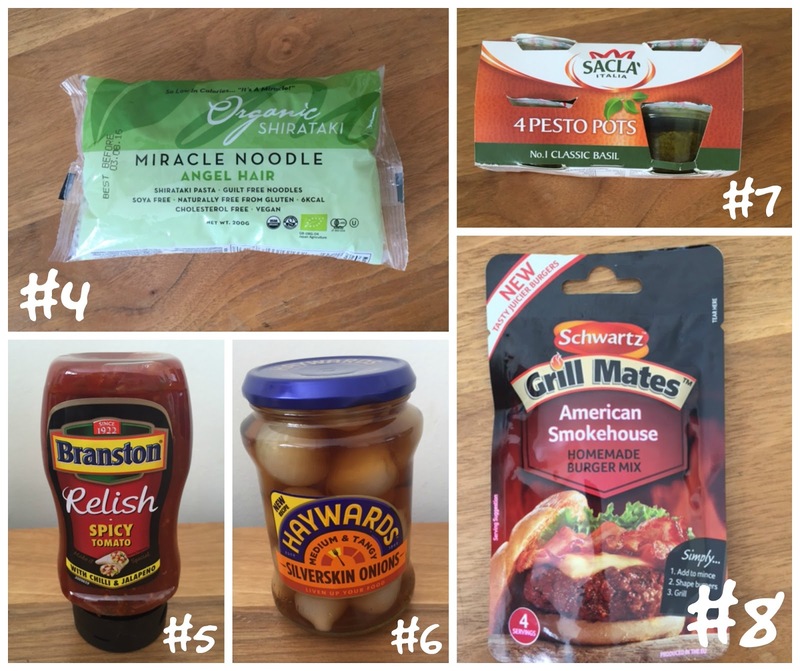 #4 Miracle Noodle have a whole range of amazing different noodles, pasta and even a fantastic alternative to rice! All healthy, low calorie and guilt free! Miracle Noodle is excited to offer Organic Angel Hair! Only 5 Calories. Zero Guilt. No Net Carbs. No Bloating. No Energy Crash. No Pasta Belly! I am looking forward to trying the noodles out when my husband is cooking one of his famous stir-fries again very soon! to ketchup with your main meal. We received the Spicy Tomato Relish and i really liked the taste of it and its defiantly will be on my table for our next BBQ in our garden. #6 Haywards Medium and Tangy silverskins bring a tang to any dish. This blend provides a classic and flavoursome taste. Crisp silverskins are a great accompaniment to a cheese board or a BBQ salad. Knowing that i won’t be reaching for them i past them on to my FIL who had them with some cheese and crackers and he said he enjoyed them very much and liked the tanginess of the silver skins. #7 Sacla’ are the original Pesto pioneers, with a wide range of Italian truly authentic recipes. I am a huge Pasta with Pesto fan and have been buying the big Sacla Pesto for a long time but i loved the idea of having little pesto pots which are just the right size for a meal for MM and myself for lunchtime when Finn is at school. Another favourite of mine is putting some pesto on top of a Naan bread and stick it in the oven for a few minutes! delicious!! #8 American Smokehouse Homemade Burger Mix has been expertly formulated to make tasty, juicier burgers. Each packet contains the perfect amount to make 4-6 burgers so there’s no need to measure! Simply add to mince, shape the burgers and grill. Available in American Smokehouse and Classic Steakhouse. Now we finally have a garden furniture and recently got our self a nice little grill the BBQ Season is officially open in our house and i cant wait to make some homemade burgers with this mix very soon! #9 Makes one portion of the Bakedin miracle Mug Brownie! A rich and velvety Belgian chocolate brownie made with the very best ingredients; such as Belgian chocolate and award winning flour. you’ve got a freshly baked brownie! Now i was very exited when i got this Bakedin Mig Brownie Product out of the box and couldn’t wait to try it out, it tasted very nice but i was disappointed that it didn’t rise alot in my mug so it felt like only half a mug of brownie goodness. 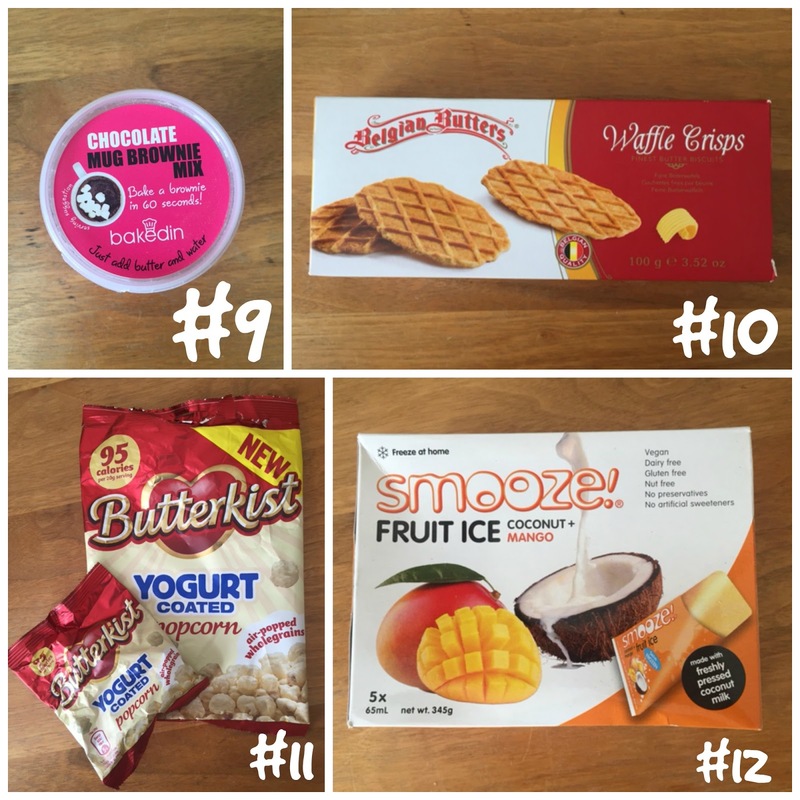 #10 Butter Waffle Crisps are a very typical and famous all butter specialty biscuit. agriculture country side of Belgium. Those amazing Butter Waffle Crisps didn’t even make it till the photo shoot, yes i took a picture of a empty box and they have to be the favourite thing in there this month! Mouthwatering goodness!! #11 Popping with taste and temptation, Butterkist’s Yogurt Coated popcorn is a lighter snack choice that’s hitting the shelves this year. You can enjoy this new guilt-free recipe while still satisfying your sweet tooth. Everyone will love the taste of this light yet creamy treat – perfect for picnics, lunchboxes, on the go or sharing at home. #12 Smooze is an all natural ‘freeze at home’ fruit ice made from 40% coconut milk and 50% fresh fruit juice and puree. Available in four tropical flavours Mango, Pineapple, Pink Guava and Simply Coconut it is 100% vegan and free from artificial additives, preservatives and all major allergens including nuts, dairy, gluten and egg. Containing on average 40% less fat, sugar and calories than other frozen treats! I love the sound of those and i am always on the hunt for new healthy frozen treats for the kids. They tasted really lush very flavoursome and i think it will be hard to share them with the kids! Overall we liked 11 items out of 12 the in the Box which is the BEST score so far!! I loved the variety of this month box and think there is something in there for everyone and it had a very summery BBQ like feel to it! So bring on the Summer!! Disclaimer: I have been sent the June Degustabox for reviewing purposes, but all thoughts and opinions are mine.